Langkawi is a resort island on the Andaman Sea. Large cruise ships may dock at the Star Cruises jetty on the southwest corner of the island beside Awana Poroto Malai Resort. Malaysia's currency is the Ringgit (MYR). There are currency exchange places in Pantai Cenang. Taxi drivers and some shops may accept US dollars. A shuttle service may be available to take you to Pantai Cenang dropping off by Underwater World. If you prefer to walk, it is about a mile to the bottom end of the beach and another mile to Underwater World. To take a taxi, walk outside the gate of the resort where there is a taxi stand. There should be a price board with fixed prices to various destinations displayed. Pantai Cenang - this area is the main resort area with a long beach. 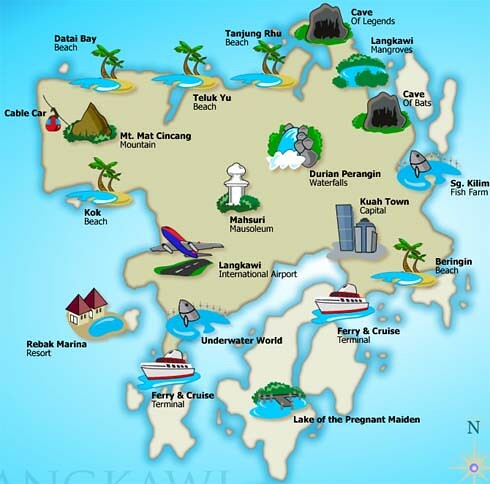 Kuah - The capital and largest town on Langkawi is located 10 miles northeast of the cruise pier. Eagle Square in the southern end of Kuah has a large eagle sculpture. Langkawi is tax and duty free. There are duty free shops and restaurants in Pantai Cenang with one adjacent to Underwater World.